Turmeric has become quite the popular spice. This is because it contains a chemical called curcumin, which has great antiinflammatory properties. These anti-inflammatory traits make it useful in treating joint, digestive and heart conditions. You may have seen trendsetters adding it to all sorts of foods, even their coffee! 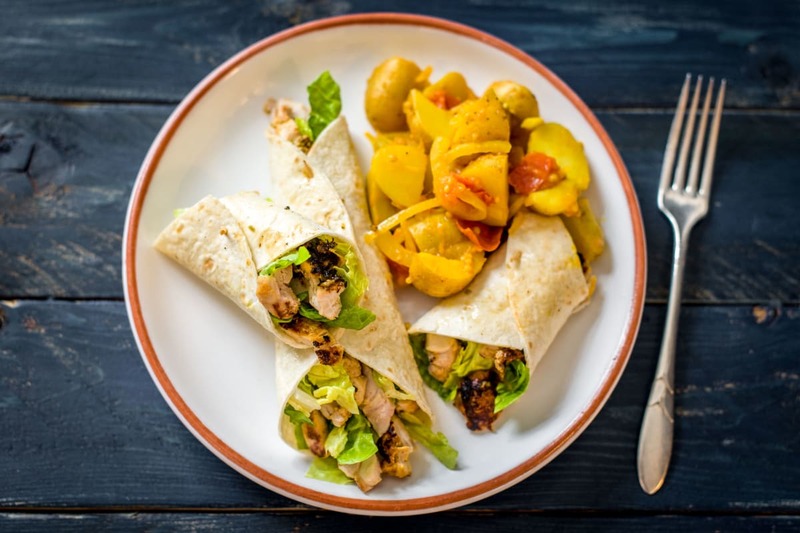 We have used it in a more traditional manner in these tasty wraps. Put a pot of water on high heat and add a generous pinch of salt. Cut the new potatoes into quarters and pop them into the pot. Lower the heat to medium and cook for 20 mins. Tip: The potatoes are cooked when you can easily slip a knife through. Drain into a colander. Don’t bother washing the pot, we’ll use it again later. 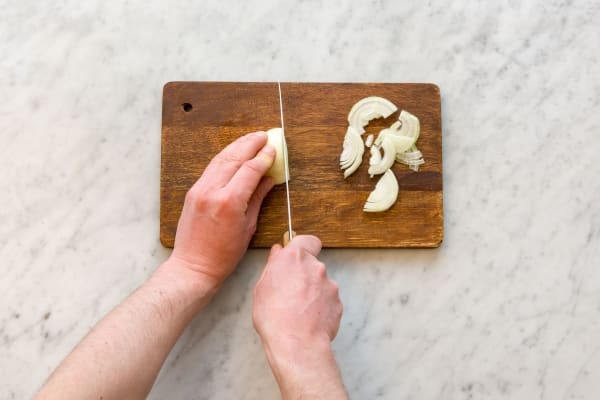 While your potatoes cook, cut the onion in half through the root, peel and then thinly slice into half moon shapes. Keep to one side. Next, marinate the chicken. 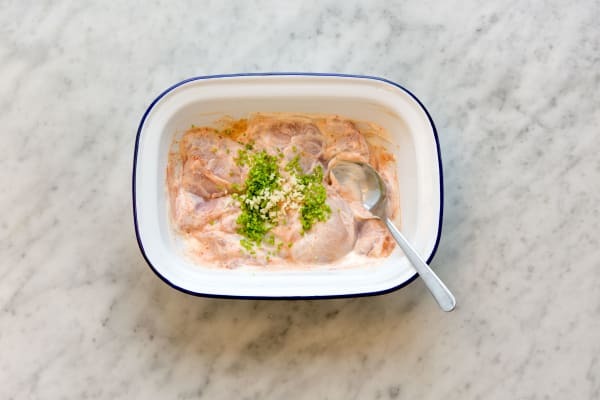 Pop your chicken into a bowl with the yoghurt and a good pinch of salt. Add the tandoori spice, mix and stir well to coat your chicken. Peel and grate the garlic (or use a garlic press if you have one). Separate the coriander leaves from their stalks. Chop the stalks as small as you can and roughly chop the leaves. Mix your coriander stalks and garlic into your marinating chicken. Preheat your grill to its highest setting and then get on with the rest of your prep. Remove the root from the baby gem lettuce and separate the leaves. Carefully shred the leaves into 2cm strips. Zest and juice the lime. Mix your baby gem leaves with your coriander leaves and lime zest. We’ll dress the leaves just before serving. Chop the tomato into 2cm chunks. Pop your chicken on a foil lined baking tray and grill for 15-18 mins. You want it to scorch so keep the heat high! Turn half way through cooking to ensure it cooks evenly. Tip: The chicken is cooked when it is no longer pink in the middle. While your chicken cooks, finish off your Bombay potatoes. Heat a large saucepan over medium heat and add a splash of oil. Cook your onion for 2 mins and then stir in the turmeric and mustard seeds. 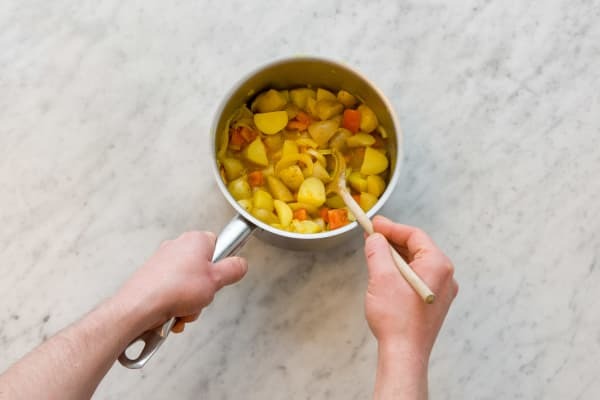 Add your potatoes, the water (amount specified in the ingredient list) and your tomato. Stir to make sure your potatoes are well coated in the spices and then leave to simmer for 5 mins. Tip: The water should boil away and the tomato begin to soften. After 5 mins, season with a good pinch of salt and keep warm with the lid on. To make your salad dressing, mix the lime juice with an equal quantity of oil and a pinch of salt. Pour over your baby gem leaves and toss well. When your chicken is cooked, allow it to cool for a few mins and then slice it widthways into 2cm strips. Fill each wrap with some chicken and a good portion of your baby gem leaves. Roll up, then serve with a generous helping of Bombay potatoes. Yum!